Irish Wolf Hound - A Giant Among Dogs! The Irish Wolf Hound, as the name implies, has strong roots in Ireland where for centuries its physical abilities were used in wars, as well as to guard property. The Irish also used the hound extensively to hunt wolves, boar and elk. The Irish Wolfhound has the distinction of being the largest dog breed, in terms of height, in the world, though its origins are not clear. However, it is known that the Romans had a fascination with this breed beginning around the 4th Century. At one point, only the nobility could own the hounds and they were so prized that wars were actually fought over them. Around the 17th century, the breed almost became extinct after it had done its job of successfully exterminating the wolves in Ireland, but was later brought back through the efforts of an army Captain by the name of George Graham. who also was instumental along with others in founding the Irish Wolfhound Club. This breed is categorized as a sighthound and its hunting instincts are very strong. It is a powerful breed, has great speed and can cover a lot of ground quickly. The Irish Wolf Hound is often referred to as the gentle giant and not without good reason. It has a mild manner and is both affectionate and remarkably gentle for its size. Wolfies as they are fondly called, are excellent companions and will respond well to training. Despite their size, it is not necessary to be harsh to gain control as they are intelligent and really want to please their owners. This hound doesn't bark a lot and is known for its courage. Though not a natural watchdog, their size most likely would be daunting to potential intruders. Because of its strong hunting instincts, it should not be in the same home with pet rabbits and the like. It can do well around cats, but this tolerance can also vary between dogs. They tend to bond with one person, but if each family member takes on some aspect of the dog's care, it will help to establish a relationship with all. Color variations: Red, black, pure white, fawn, gray and brindle. The coat is harsh and wiry on the head with the hair being longer around the eyes and under the jaw. Regular brushing is needed as well as tidying around ears and feet, removal of excessive hair around the ears and nail trimming. Because of the adult size of this dog, it is a good idea to get him used to the grooming activities while he is still a young puppy! The important information to know about a dog such as this one that grows fast, is to curtail normal walks until after six months of age to prevent the possibility of skeletal damage. In the meantime, although puppies should have the opportunity for play, this too should not be overdone for the same reason. Also, to sustain this dog's fast rate of growth, ample sleep is needed. As an adult, the Irish Wolf Hound can be quite placid and not that active indoors. However, they are innately born to chase and ideally they should have an opportunity to safely run free at times. If you love long walks or are a runner, this dog - when conditioned - will make an excellent partner. This breed requires plenty of room to move around without restraint both inside and out. A good sized yard is recommended, but don't leave them outside for long periods as they desire their family's close companionship. Also, don't forget to move your decorative and/or treasured objects to higher ground to avoid a fatal, yet accidental brush from your Wolfie! They are a very good with children, being gentle, patient and affectionate, but their large size should be considered in families with toddlers. As always, no matter what the breed of dog, caution and supervision is recommended whenever children play with any pets. The Irish Wolf Hound is not a suitable breed for the elderly due to the difficulty in handling a dog of this size. A must have, very comprehensive book for soon-to-be and current owners of the breed. Contains excellent photographs, as well as advice on puppy selection, invaluable medical information, training and care, plus fascinating history of the breed. One reviewer refers to this book as the "Wolfie Bible". 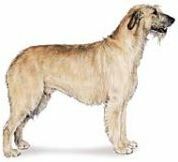 Irish Wolf Hounds Expert advice about the breed including: feeding, training and behavior, grooming, health, and a lot more. Up-to-date and informative. Many full-color photos and line drawings.